In the first decade of the 21st century, the population of the world produced more economic output than in the first 19 centuries of the common era combined. If people do make history, then two people make twice as much history as one. Since there are almost 7 billion people alive today, it follows that they are making seven times as much history as the 1 billion alive in 1811. Measured in years lived, the present century, which is only ten years old, is already “longer” than the whole of the 17th century. Over 23% of all the goods and services made since 1AD were produced from 2001 to 2010, according to an updated version of Angus Maddison’s figures. 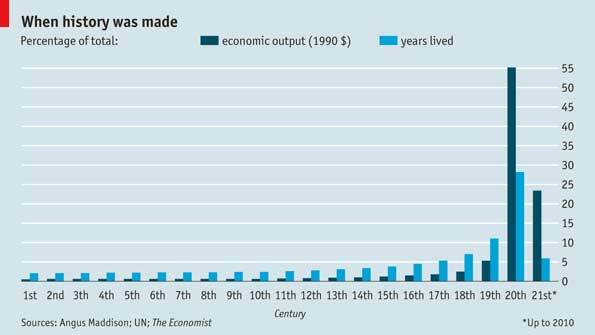 55% of all goods and services were made in the 20th century.